Power plant boiler houses designed to burn coal or high sulfur oil are required by Federal and State pollution regulations to “scrub” (remove) sulfur dioxide from flue gasses to meet emission limits. SO2 in flue gasses is known to be harmful to the environment, as it is one contributor to the formation of acid rain. pH control is critical for the proper functioning of the scrubber system. Flue gas desulfurization (FGD) technology, is commonly referred to as a scrubber, is proved and effective method for removing sulfur dioxide (SO2) emissions from the exhaust of coal-fired power plants. The basic principle of a sulfur dioxide scrubber system is the removal of SO2 by using its chemical characteristics to combine with water. In some cases, parallel rotating rods create a series of short throat Venturi openings. A series of low pressure, large orifice spray nozzles direct the scrubbing solution into the system. “Scrubbing liquor” is introduced into the system with the flue gas stream. Depending on the design of the scrubber, the gas can flow either concurrent (with) or counter-current (against) the scrubbing liquor. The high velocity turbulence caused by the Venturi openings ensures maximum gas to liquid contact. It is here that the droplets absorb the SO2 as well as impacting and dropping particulates out of the stream. The scrubbed gas is then sent through a demister or re-heater to prevent condensation and exhausted to atmosphere. The scrubbing liquor can be bubbled through a slurry or either lime, Ca(OH)2, or limestone, CaCO3 and water. Either lime or limestone will combine with the sulfite ions from the flue gas to form gypsum, CaSO3. The SO2 that is captured in a scrubber combines with the lime or limestone to form a number of byproducts. A primary byproduct is calcium sulfate, commonly known as gypsum. Spent scrubbing liquids are sent to clarifier where the insoluble gypsum is removed and the water is returned to the scrubber system. The addition of lime or limestone to scrubbing solution is controlled by monitoring the pH of the solution. Lime slurries are generally alkaline with a control point near a pH of 12 while limestone slurries are more neutral. A pH measurement is one of the testing methods used to monitor continuous blowdown and replenishment. The SO2 within the scrubbing gases can be controlled by maintaining the level of caustic scrubbing chemicals that are commonly used. pH is a critical factor for proper operation of a scrubber. It is also difficult to measure due to 2-15% solids and tendencies towards scaling, coating and plugging. CaSO4 concentration decreases slightly as pH decreases. Furthermore, because the concentration of oxygen dissolved in the slurry is constant, the formation of sulfate depends only on the concentration of SO3. The precipitation of CaSO4 increases as pH decreases, thus CaSO4 is apt to form scale at a lower pH. Hard scale formation can be controlled by keeping the pH high. The solubility of CaSO3 increases greatly as pH decreases or conversely CaSO3 forms a precipitate as pH increases. If pH is too high, “soft pluggage” occurs. Soft pluggage is due to formation of calcium sulfite precipitates which appear as large leaf like masses. Obviously maintenance of equipment that has soft pluggage is easier than with equipment that has hard scale. In many cases where soft pluggage has occurred, it can be melted off simply by lowering the pH (increasing solubility). It is obvious that a potential dilemma exists, operation at too low pH promotes the formation of hard scale and operation at too high of a pH promotes the formation of soft pluggage. Only through experience can the proper pH range be determined. Typically limestone is added to achieve the desired level of SO2 removal based on the sulfur content of the coal, the boiler load and the monitored SO2 concentration of the flue gas, while maintaining the pH in the reaction tank at 5.5 to 6.0 pH. The pH sensor can be located in the re-circulating tank or the re-circulating line. Conductivity one of the most common testing methods used to monitor the concentration of scrubbing chemicals and by-products. As the concentration of the scrubbing chemical is depleted, its contribution to the total conductivity value will also decrease. However, occurring at the same time, the contribution to conductivity from the by-products is increasing. Therefore, a measurable decrease in conductivity is detected as the scrubbing solution is depleted. Difficulties can arise, however, when more than one gas is being scrubbed. Depending upon the relative proportions of the gases, the by-products formed will differ, leading to variations in the conductivity background. Although a conductivity measurement can be difficult or impossible, it may still provide a useful alarm point to alert the operator to check a grab sample. 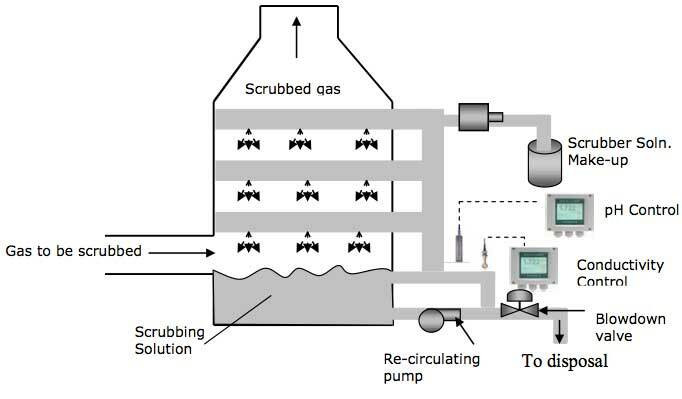 In scrubbers where the scrubbing chemical concentration is maintained by continual replenishment and blowdown, conductivity can be used to initiate blowdown to prevent high dissolved solids build-up. In continual replacement scrubbers, conductivity can be used to initiate blowdown to prevent high dissolved solids build up. Torodial or Inductive conductivity is the best form of measurement to use in this application and the sensor should be located where it will be exposed to a representative sample.